Writing about his own dogs in A Dog Year, Jon Katz became immersed in a larger community of dog lovers and came to realize that in an increasingly fragmented and disconnected society, dogs are often treated not as pets, but as family members and human surrogates. The New Work of Dogs profiles a dozen such relationships in a New Jersey town, like the story of Harry, a Welsh corgi who provides sustaining emotional strength for a woman battling terminal breast cancer; Cherokee, companion of a man who has few human friends and doesn’t know how to talk to his own family; the Divorced Dogs Club, whose funny, acerbic, and sometimes angry women turn to their dogs to help them rebuild their lives; and Betty Jean, the frantic founder of a tiny rescue group that has saved five hundred dogs from abuse or abandonment in recent years. 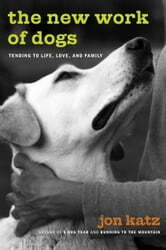 Drawn from hundreds of interviews and conversations with dog owners and lovers, breeders, veterinarians, rescuers, trainers, behaviorists, and psychiatrists, The New Work of Dogs combines compelling personal narratives with a penetrating look at human/animal attachment, and questions whether this relationship shift is an entirely positive phenomenon for both species. Katz offers us a portrait of a community, and by extension a country, that is turning to its pets for emotional support and stability—a difficult job that more and more dogs are expected to do every day. The New Work of Dogs is a provocative and moving exploration of the evolving role dogs play in a changing and uncertain world.